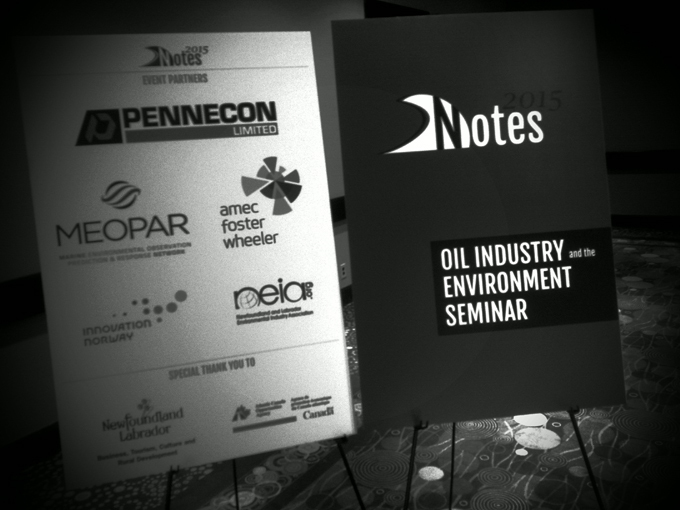 ST. JOHN’S, NL – Last week the Newfoundland and Labrador Environmental Industry Association (NEIA) held its Oil Industry and the Environment Seminar, NOTES 2015. The two-day event brought operators, large corporations, SMEs, federal and provincial governments, and academia together to discuss environmental challenges the oil and gas industry faces in the region, and to explore possible solutions. “It is important that we do what it can to balance this important industry in our economy with the beautiful natural environment which provides a living for many Newfoundland and Labradorians,” says Ted Lomond, Executive Director of NEIA. The event was anchored by a keynote presentation by Preston Manning, CEO of the Manning Centre and member of Canada’s Ecofiscal Commission’s advisory board. Manning spoke on the pursuit integrating energy and environmental interests through market mechanisms – a topic of growing importance in Newfoundland and Labrador as its provincial counterparts are implementing programs to address climate change. NOTES 2015 featured a wide spread of topics ranging from environmental effects and monitoring, to oil spill response technologies, to the socio-economic impacts of the industry to-date, to a keynote panel discussion on benefits agreements and their application on future mega-projects. “Important discussions were had on the past, present, and future of the industry in Newfoundland and Labrador, and how we can structure future agreements for the long-term benefit of the province,” noted Lomond. One session of the agenda focused exclusively on planning and consultation. “Whether oil and gas projects are the negotiation, construction, operations, or de-commissioning stage, we learned that proper engagement is a critical factor in success,” says Lomond. More information on NOTES 2015 can be found on the conference website at www.neia.org/notes2015. NEIA is a not-for-profit association of businesses that promotes the growth and development of the green economy in Newfoundland and Labrador. NEIA has over 190 members. More information can be found at www.neia.org.